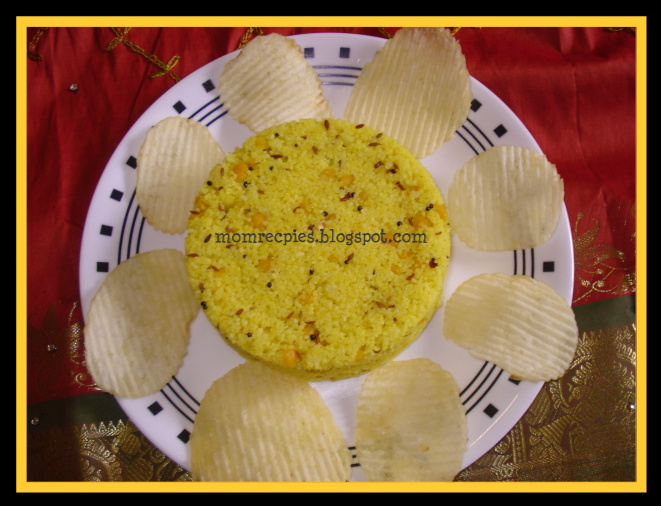 This Lemon rava pulihora is very easy to make and tastes delicious.Even kids love this.This can be eaten as breakfast or lunch or dinner.It is a great picnic meal too. 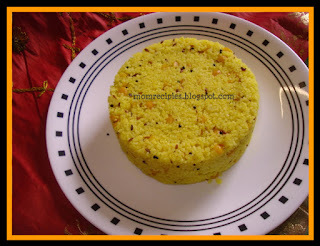 1) Usually we get Rice Rava (Biyyapu Rava) in Indian stores. Or else, wash the rice and dry it on a cloth. Grind to coarse mixture. 2) Soak the chana dal for at least 20 minutes. 3) Heat a pan add 1 tsp oil, Add 2 glasses of water (500 mi) ,salt 1/2 tsp ,1/4 tsp of turmeric. 4) When water is boiling add channa dal . 5) Stir continuously for a minute and put a lid. When it cooks completely then add rice rava. Stir it well and put a lid,Reduce flame and cook till soft. It just takes 5 mins to get cooked . . When it cooks completely switch off stove and open lid after 10 mins. 6) Cool out the cooked rice rava on a wide or big plate. 7) Mean while cut lemon and squeeze their juice in a bowl along with 1 1/2tsp of salt and keep it aside. 8) Heat oil in a pan fry ground nuts /peanuts till nice golden color remove and leave a side.Now add mustard seeds.After they splutter add cumin seeds,red chillies,slit green chillies ,curry leaves, asafoetida and 1/4 tsp turmeric powder and fry for a minute.Then switch off the stove. 9) Add the seasoning and lemon juice to cooked rice rava and mix well without any lumps and lemon juice coats evenly.Mix roasted groundnuts.Adjust the salt and lemon juice if required. 10) Serve it after an hour or 2 hours. Tasty and sour nimmakaya rava pulihora is ready to serve. Serve with appadam or chips. Pulihora tastes best after sitting for a couple of hours from the time of preparation.